Reach the people in the New River Valley who leave their couch! With over 10,000 folks* from the area using NextThreeDays.com each month to find fun events and specials to enjoy, NextThreeDays provides you the perfect opportunity to help promote your business or event at an affordable rate. Whether you are a new business wanting to spread the word about your opening, an established business needing more people in the door, have an event you want to promote to the masses, or just want to help brand your product or business, NextThreeDays can help. * Note: These are not the number of copies we print, these are real people who are visiting NextThreeDays and actively using the website. Full Wrapper Ad (~400 W x 850 H) - Largest ad space to get your message across. Ad literally wraps around the NextThreeDays content. Appears on our two most popular pages our Front Page, with ad rotating every 20 seconds, and on our Featured Events Details page. 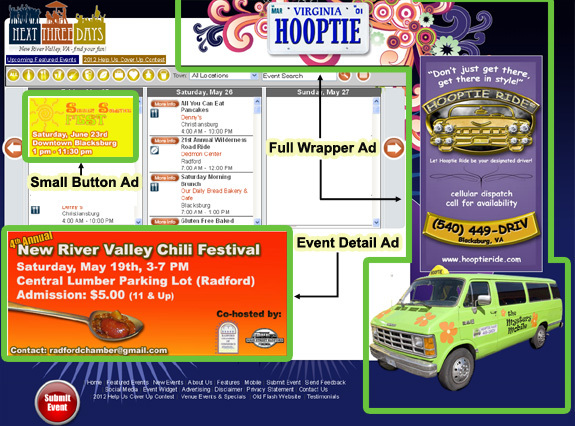 Event Detail Ad (575 W x 255 H) - 2nd largest ad space. This ad appears on the Event Details section of our Front Page as well as on the Featured Events page, the Top 20 Events and New Events pages. The ad changes each time a user loads the page. Small Button Ad (212 W x 120 H) and Mobile Ad (270 W x 153 H) - You get two ads for the price of one! The Button Ad appears as the first item in the first day’s display on the Front Page. The Mobile Ad appears as the first item in the Mobile Event list. Both ads change as a user filters through events. Sponsored Event Listing Your Event Listing will be highlighted in yellow on both the Front Page and Featured Event page. Your event will receive top billing and appear at the top of the Front Page on it's event date. Purchase a month or longer Full Wrapper or Event Detail Ad and receive a complimentary Mobile Ad for the same time period. 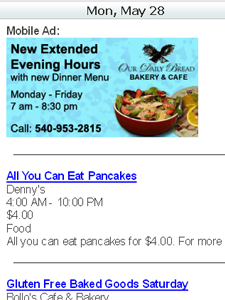 Note: Advertisers can change ad designs throughout their ad contract at no additional cost. We only require a three-day lead time to make the updates. For example, if you have three upcoming events can split an Ad Contract amongst the three events. $5.00 per event and no design fees. Events that span multiple days must pay for each day. Have a Unique Advertising Idea or Want to Combine Multiple Ads? Tell us what you have in mind and I promise we will listen. We are very flexible and love outside the box thinking especially when it creates something outstanding. While I can't promise we'll proceed with your idea, we have put together many creative ad packages and trades for our customers and plan to keep it up in the future. So bring on your ideas and let's create something special together! E-mail NextThreeDays President jami.ryan@NextThreeDays.com with your idea. with Advertising Kit in your subject line. If you can provide the full design of your ad, then design fees are not necessary and won't be included. Design fees are only required if we have to design your ad for you. Time estimates are listed below. * Note: All advertising fees must be paid in advance. If you're interested in advertising with us, please contact: President Jami Ryan via e-mail at: jami.ryan@NextThreeDays.com or by phone at: 540-391-0340.